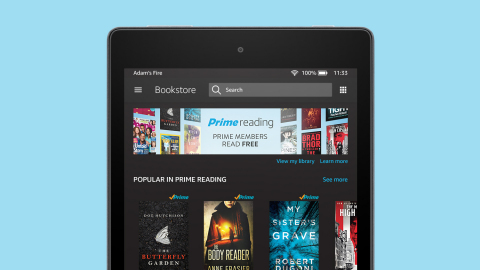 Prime members are now able to read as much as they like from a selection of over a thousand top Kindle books, magazines, short works, comic books, children’s books and more – all at no additional cost. Enjoy best-selling Kindle books including The Hobbit, Harry Potter and the Sorcerer’s Stone, The Man In the High Castle, The Millionaire Next Door, Half Way Home and When I’m Gone, comics such as The Complete Peanuts Vol. 1 and Transformers: Robots in Disguise Vol. 1 as well as short works including Kindle Singles from Andy Borowitz, Stephen King, Jane Hirshfield and classic works from Gloria Steinem, Norman Mailer and Kurt Vonnegut. Explore current issues of premium digital magazines including Bon Appétit, National Geographic Traveler, People, Sports Illustrated, HGTV, Popular Mechanics, Golf Digest, Runner’s World and more. No Kindle device required – enjoy using the free Kindle apps for iOS and Android as well as from any Kindle or Fire tablet. SEATTLE--(BUSINESS WIRE)--Oct. 5, 2016-- (NASDAQ: AMZN) – Amazon today introduced Prime Reading, a new reading benefit for U.S. Prime members. Prime members can now enjoy unlimited reading from a rotating selection of books, magazines, comics and more – at no additional cost. Prime Reading joins the growing list of all-you-can-eat benefits for Prime members including unlimited fast, free Prime shipping, unlimited access to Prime Video, Prime Music, Prime Photos, Audible Channels, early access to Lightning Deals and more. Members can start reading now by downloading the Kindle app for iOS and Android or using any Kindle or Fire tablet. To learn more about Prime Reading or start a 30-day free trial of Prime, please visit amazon.com/primereading. Over a thousand popular books: Enjoy a diverse selection of titles including Red Sparrow, The Butterfly Garden, The 5 Love Languages, The Atlantis Gene, Lonely Planet travel guides and books from best-selling authors Brad Thor, Barry Eisler, Stephen Covey, James Altucher, Rachel Abbott and more. Premium Magazines: Stay on top of current trends with a rotating selection of fresh, full issues of top magazines covering sports, technology, cooking and home improvement, current affairs, notable people and more. Exclusive short content: Read Kindle Singles Classics – classic short-form reads by the world’s top writers, from Susan Orlean to Norman Mailer. Also read from hundreds of Kindle Singles – short stories, memoirs and essays from a variety of top writers. All your favorite Kindle features: Enjoy all the great Kindle features customers love such as Page Flip, Popular Highlights, X-Ray and Goodreads integration, all while using your favorite Kindle eReader or Fire tablet or free Kindle app for iPhone, iPad, Android phone, tablet and more. Prime Reading is the latest in the growing set of reading benefits for Prime members which also includes the Kindle Owners’ Lending Library and Kindle First. Prime members in the U.S. can get started by visiting amazon.com/primereading. Readers wanting even more can enjoy unlimited reading from over one million books, magazines, and audiobooks by starting a 30-day free trial of Kindle Unlimited. A Prime membership is already the best deal in the history of shopping. Tens of millions of Prime members around the world enjoy the many benefits of Prime. In the U.S. that includes unlimited Free Two-Day Shipping on more than 30 million items across all categories, unlimited Free Same-Day Delivery on more than a million items in 27 metro areas, and one and two-hour delivery with Prime Now on tens of thousands of items available in more than 25 metro areas. In addition to fast, free shipping, members have access to unlimited streaming of tens of thousands of movies and TV episodes with Prime Video, more than one million songs and thousands of curated playlists and stations with Prime Music, unlimited access to short form episodic Audible Channels for Prime as well as a rotating selection of audio books from Audible, early access to select Lightning Deals all year long, free, secure, unlimited photo storage with Prime Photos and one free pre-released book a month with Kindle First.